Have you ever wondered how to find out the name of any song or music that you hear at some place? You cannot do this few years back using technology but now it can be possible using Music Search Apps or Music Identification Tools. These music search tools or song finder apps come in very handy to identify music and songs especially in a situation when you have no other way to know the name of the music or song playing around you. To use these apps and online tools you have to either upload the music clip or play the music to the app, and after this app match that music or song in their database and if the match is found then the music or song details will be displayed on your mobile device or computer. There are also some apps using which you search a song if know a small part of the lyrics. These are also known as lyrics search tools. Here in this post I will list all the best music identification apps and tools to find the details about a particular music or song so that you don’t have to ask anyone that What song is this or What is this song? Here are the most popular music discovery tools and music identifier apps to identify songs and music playing around you. Shazam is one of the top song identifier and music recognition or music discovery app. You can also say that it is one of the best music recognition app available on mobile phones. This app can name that song in seconds which you were looking for. Shazam App is available for Android, iOS and Windows Phone. You can download it for free from the links given below. 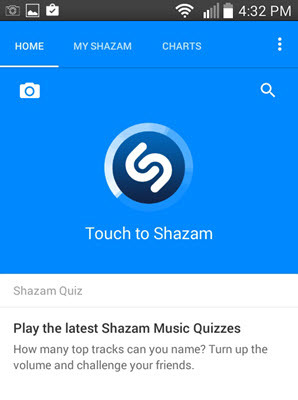 To use the Shazam App launch the app in your mobile phone after downloading and installing it. Now Play your song or music. After this if your music or song is identified then the details of song will be listed. The various details provided by Shazam are song name, artist, album, lyrics and the release date. You can do much more than just identify songs in Shazan. You can sing along your songs with the real time lyrics and also watch youtube videos of your favorite artist. You can buy Shazam songs from Google Play Music and Amazon and launch Pandora radio based on artists you Shazam. Also you can follow your favorite artists to see what they are Shazaming about and find what music is currently popular in your area. Note: Shazam does not work when you sing song or hum by yourself to the app. It only works with the music that is pre-recorded and it is played in its original form. SoundHound is another very good app to identify and find music and songs on your mobile phone. This music identifier app is as good as the Shazam and in some cases even better on which I will discuss next. The major advantage of SoundHound over Shazam is that in SoundHound you can even sing or hum to the app to identify song or for music recognition but it is not so in Shazam. The procedure to identify music or song in SoundHound is exactly the same as in Shazam. 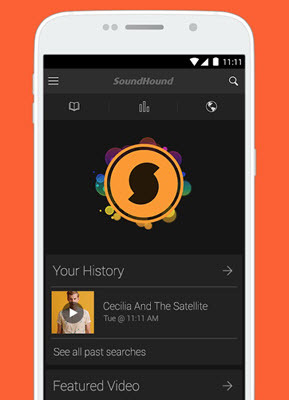 Launch the SoundHound app and then Tap the Orange button and then start singing or play the song or music to it. After few second you will get the song details, album details, artist and the lyrics. You can also view live lyrics in SoundHound and sing along with it. Using SoundHound you can also check weekly features songs, artists and albums. Also you can discover the popular music playing around in your area. Like Shazam, in SoundHound you can purchase the song from Google Play and stream live music from online music streaming services like Spotify, Pandora and Apple Music. You can even browse the top videos others are watching and can also find each and every details about an artist, album and access their photos and biographies. So in all it is a great music search and song identify app and it is highly recommended by me. SoundHound Music Search is available for Android, iOS, Windows Phone and Blackberry platforms and you can download it from the links given below. TrackID is also a mobile music discovery app and it comes from a big company Sony. TrackID is identical to Shazam and SoundHound and does the same thing which these apps do. But it does not come with that many features that Shazam and SoundHound have. 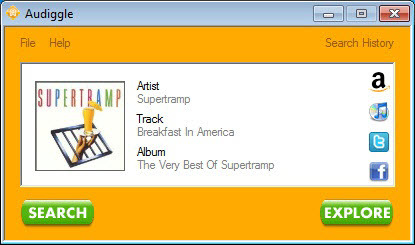 Like Shazam, TrackID also does not identify the songs when you’re are singing or humming. It only works with pre-recorded music playback only. The procedure to identify the songs is same as the above mentioned apps. 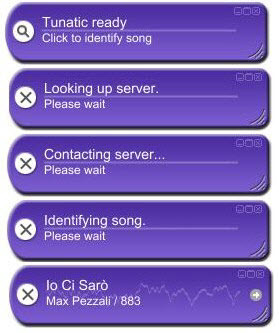 Launch the TrackID app and then press the violet or purple button and the play the music for it for identification. After identification details like album name, label, release, song name and artist name will be presented to you. There is no lyrics functionality or feature in this app so it is a downside of this. But you can download the song from the music store it has. TrackID is a lightweight and simple app and does perfectly what is meant to do i.e to identify music and songs. TrackID is only available for android platform and you can download it from the link given below. How can we forget Google when it comes to finding anything, be it a song, image or anything other. Google Play Sound Search or Sound Search for Google Play is small widget or add-on that is used to identify the songs playing near you. 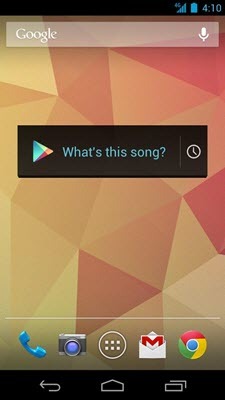 To use Sound Search for Google Play you have to add the widget to your Home Screen and then touch on the What’s this song? button to identify the song when the song is playing. After that result containing the name of the song and artist will be displayed on your mobile screen. You can buy the song directly from the Google Play store from there. Also you can view your search history and delete it according to your preference. This app from Google is not that feature rich and advanced than the above mentioned music search apps but it is still worth mentioning. Sound Search for Google Play is available for Android devices running Android 4.0 higher and in select countries only. You can download this Sound Search for Google Play widget from the link give below. 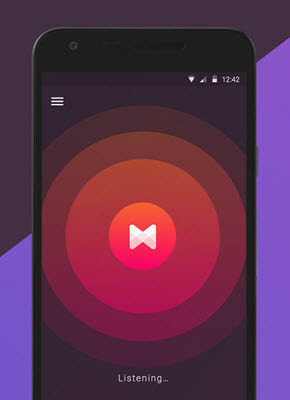 Musixmatch is one of the best music search and lyrics search app available right now. Musixmatch currently has the world’s largest music lyrics catalog and you can enjoy your music with synced lyrics. 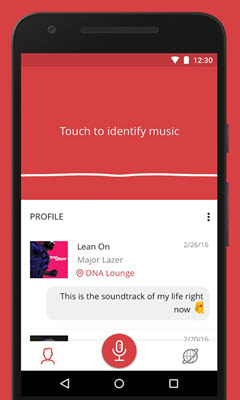 Musixmatch can let you find lyrics if you remember a part of lyrics or you can find it by playing the music from an audio source like TV, Radio etc. to the App. So this app is just like Shazam, SoundHound and TrackID but it offers something more with its song lyrics search functionality. You can listen to your favorite songs with synced lyrics using music streaming apps like Spotify, Pandora, Play Music or any other music apps. It is a must have App for music lovers and it is available free for Android, Windows and Apple iOS devices. You can download this amazing music app for your mobile device from the links given below. Highly Recommended by me. MusicID is just another music recognition app to identify the music playing around you. The working of this song identifier app is similar to the above song identifier apps where you have hold the app to the music and after few seconds if the match is found then the name of the song, artist, album and music details will be displayed to you on your mobile screen. It has also got a powerful search where you can search songs by artist name, song title and by lyrics. This app is OK but not that great if we compare it to the popular songs identification apps mentioned above. On MusicID can buy and download the song that you have identified, add notes to the song so that you can remember why and where you have identified it, view the similar songs to your favorite artists, view artist biographies, and view compelling artist page. MusicID app is available for only for Android devices and you can download it from the link mentioned below. SpotSearch is a premium app from Spotify that is used to find the name of the song or music on the basis of lyrics. 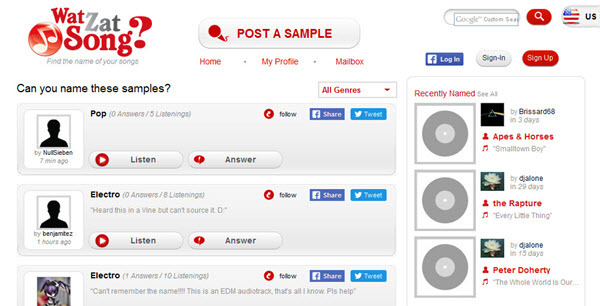 It is not like Shazam, SoundHound or TrackID where you can play or sing a song to identify it. 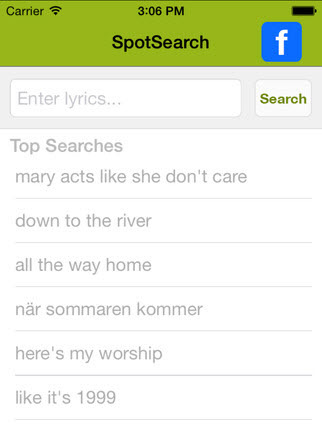 If you know a small part of lyrics then you can find the name of the song by using the SpotSearch. Just enter the part of the lyrics that you know in the search box, tap the search or find that song button and you will be provided with the results matching to those lyrics. SpotSearch is available for Android and Apple iOS platform and you can download it from the links given below. 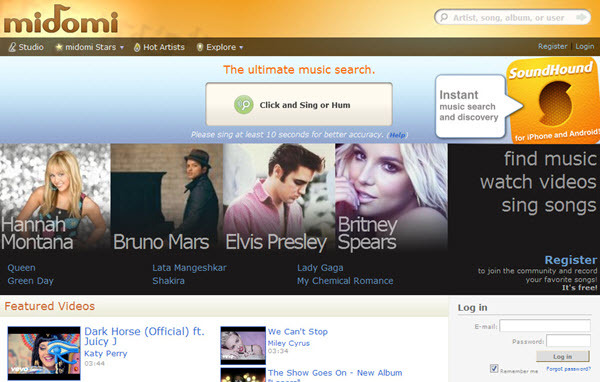 Midomi is a web based music search and song identifier app from SoundHound. Technically speaking Midomi app was rebranded as SoundHound for mobile devices. To search music on midomi click on the Click and Sing or Hum button located on the center top of the website and then play or sing the song. You need a microphone in your computer for this. After you are done click on Click to Stop and if the music or song is found in their database then the result will be displayed on the midomi website. There is also a text based search by which you can search the music or song info on the basis on artist, song, album and user. You can also buy the song you like from there. Besides music discovery you can do much more on midomi website. You can watch youtube videos of your favorite artist; find all information of your favorite artist, album and their photos, bio and much more. You can register on the midomi website to record your own music and get updates on your favorite artist and the new music albums and songs. Also you can add photos, create your playlist, add friends and do much more. For music lovers this is a website that should not be missed. Audiggle is software based tool for finding music playing nearby you. Audiggle software is available for Windows and Mac OS. Here first you have to register and then download and install the Audiggle software on your PC. After this log in to the software using your username and password and then can search the music or song that is being played from TV, Radio or any other music source. Audiggle is not completely free and you can search up to 5 queries per month for free. If you want to perform more searches then you have to upgrade to its Pro Subscription plan. To use Audiggle download and install the Audiggle software and login with your registered username and password. The play the song or music and click on identify to identify song or music. If the song is found then the result will be displayed to you on your computer screen. Tunatic is a free music identification software from wildbits.com. Just like Audigiggle it is also a software based music recognition tool. If you love that song but don’t know what it is? Then Tunatic can tag it for you. Tunatic is a very small software and it takes only couple of seconds to install it. After installing Tunatic play the song or music that you were looking for and then click on Click to identify song. After that if the song is found then the result will be display with the song name and artist. Tunatic is available for Windows and Mac and you can download this small song identification software from the link given below. 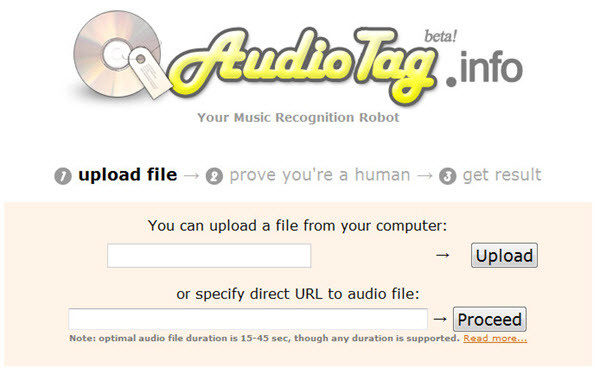 AudioTag is a web based tool that has a different way to detect your music. In this tool you have to upload the audio file to their website or provide the direct link to the song file. After that you have to enter the captcha and after this if the song is found in their database then the result will displayed on your computer screen giving you details like song name, artist, album name and year. AudioTag is completely free to use and the popular file formats supported by Audiotag are wav, mp3, flv, mp4, mpeg, flac, ogg, amr and much more. WatZatSong is a large online music community where you can ask other members to identify the name of song or music that you are looking for. Here first you have to register and join the WatZatSong community and then post the sample of the song or music by uploading it on the WatZatSong website. After that the various members can listen to that song and if they know it then they will post the answer giving the Artist Name, Song Title. This is a bit time consuming way to know the name of the song because it not an automated service like others, but is a great community for music lovers. In Analyze video you can paste your youtube or dailymotion video link and then it will show you result clearly stating that at which time internal which music or song is played. Find music is to search music on youtube, daily motion. Here you have to enter the artist name, song name or album name. The Search YouTube option is to search Youtube for videos, music or anything related to it on youtube. Here you have to enter the search query that includes song name, artist, album etc. and hit the Moo button to get results. 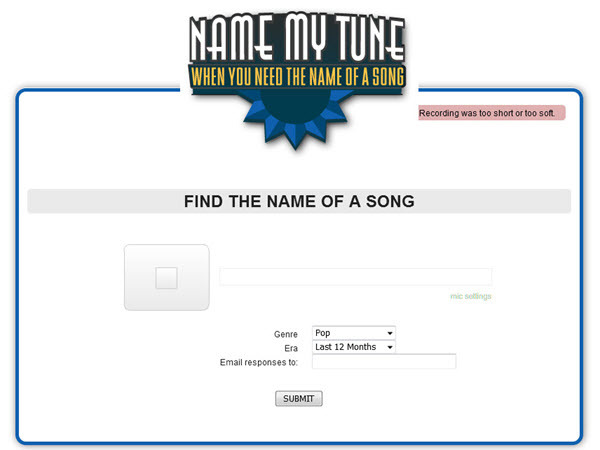 Name My Tune is a web based song recognition app where you can play music or song to it and it will then identify it if the match is found in its database. 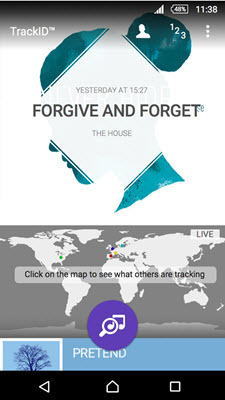 The design of this app is very plain looking and there are no additional features present in it. There is a recording button on the front which have to press when you play any song and then stop it after some time. You need to have mic on your computer to use this song identifier app. Musipedia is The Open Music Encyclopedia and is meant for users who have learned music and have good knowledge of musical notes, melody and other technical things in music. Musipedia also offers a SOAP interface which lets you integrate Musipedia search in your web service and will enable you to search based on melody, contour, or rhythm. You can visit Musipedia, The Open Music Encyclopedia by going to the link given below. 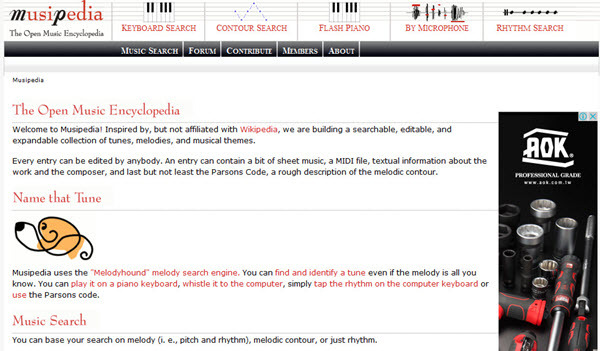 Like Musipedia folk tune finder is also a melody search engine that is meant for users having good knowledge of music. 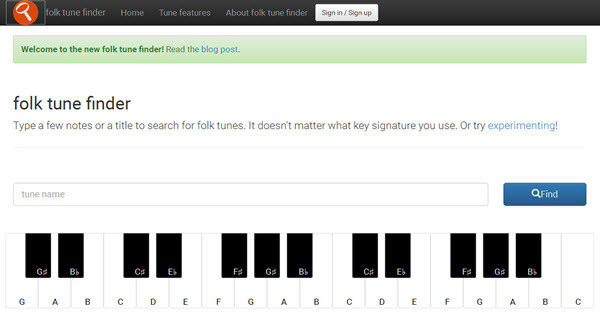 In folk tune finder you can search for folk tune by entering few notes or the title. On folk tune finder you can find huge collection of ABC tunes. It is a very good tool for musicians and music experts. 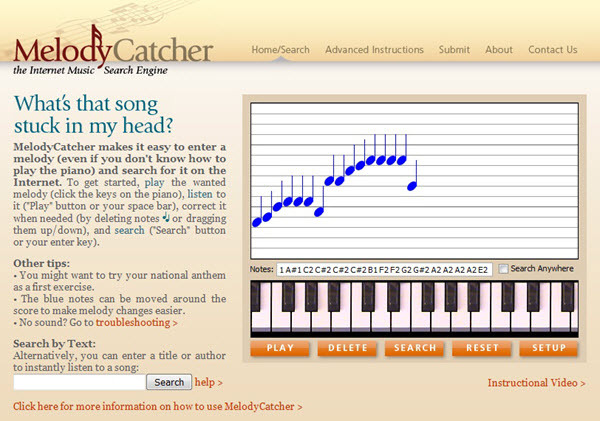 MelodyCatcher is another web based melody based search engine where you have to enter the melody in form of notes to identify it. There is a virtual piano present and using it you have to enter the notes and then click on search button to search the music you are looking for. You can also play, delete or restart the melody if you want to. This is a nice melody search app but again it requires quite a bit of knowledge of music if you want to use it. There is also a text search box where you can enter a title or author to instantly listen to a song. This web based app requires Java for its working so make sure that you have the current version of Java installed on your computer. All these above mentioned music and song recognition apps are handpicked by me and they work flawlessly. They come in very handy to identify any song, music and melody. If you have any questions, doubts or queries regarding these music recognition and song identification apps then you can ask me by leaving a comment below.